Tori Spelling and husband Dean McDermott have a reality show on Oxygen called “Tori & Dean: Home Sweet Hollywood.” This season we watched as they bought their home and renovated it from top to bottom. Big-Time Listings says they paid $2.27 million for it in January ’08, and it’s now on the market for $2.3. 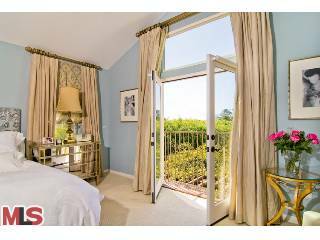 Nestled in a charming pocket of Westwood, this home is ideal for entertaining featuring French doors off the main rooms that lead to lushly manicured yard w/ saltwater pool & spa. 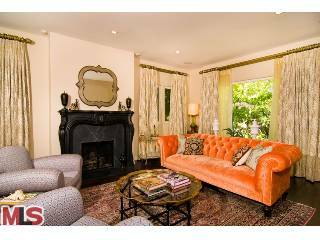 The property boasts a grand living room with designer fireplace, media room and formal dining room. What do you think? Did you watch them renovate it on their show? I got sucked into “Home Sweet Hollywood” because I wanted to see how this house would turn out. After all the work they did on it, I was surprised to hear they were selling it already. Spelling’s memoir sTORI Telling came out earlier this year and talks about what it was like growing up as the daughter of Aaron Spelling, which the Guinness Book of World Records calls the most prolific TV producer in history. After his death in 2006, it was reported that she had been “disinherited.” It turns out she did receive some money, but it was less than a million dollars from his multimillion-dollar estate. 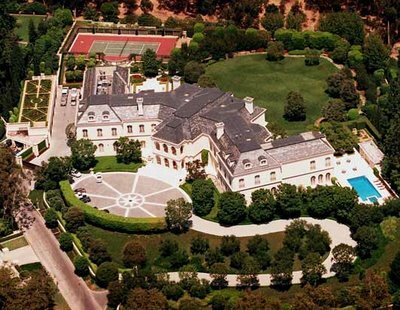 People are always asking about my parents’ mansion, which they called the “Manor.” After demolishing Bing Crosby’s former estate in Holmby Hills, a fancy neighborhood in west L.A., they spent six years building the Manor. It’s about 46,000 square feet (slightly over an acre) and has 123 rooms. Not that I counted or measured. I got those figures from the press, just like everyone else. Anyway, we moved in when I was seventeen and I only lived there for two years. In some ways the house is like a normal house, but everything is on a bigger scale. It has four floors: the basement (which we call the “Lower Level,” probably because that’s its designation on the elevator) and the first, second, and third floors. The first floor has a kitchen, a breakfast room, a dining room, an office, a family room, a living room, and a projection room. There’s a grand foyer with sweeping staircases on each side. Oh, and there’s also a guards’ room and the staff dining room. Everyone except fancy guests comes through the service entrance into a hallway with the guards’ room and the kitchen. 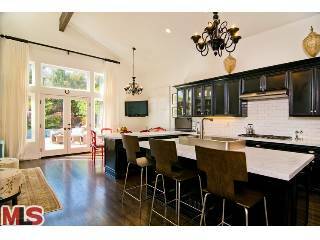 UPDATE: Check out photos of Tori’s new house and the Spelling Manor. There home is great! Full of color and best of all, it totally reflects her personal style. Well, I think Tori should be on Design Star. but remember how I don’t always get it? Maybe they’d like her. 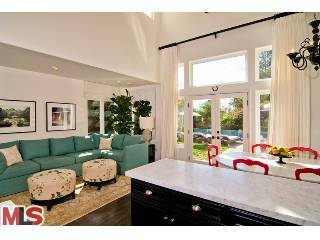 I liked her wood floors, but were those vertical blinds in the ho-hum-for-a million-something-dollar-house-bathroom? And doesn’t poor little Liam look like the ignored and rejected child in that OK picture? It made me sad! Why it is so fun to see inside celebrity homes? I love it! At least it seems like Tori’s house has some personality. Lots of times it seems like a decorator does it all and the homeowner has no input. That said, some of the colors are too bright for me. Those red kitchen chairs and the tangerine couch! In that photo of the staircase, you can actually see the children’s rooms glowing at the top. Thanks for the peek inside, Julia. Whew! Maybe the wallpaper in the dining room is what keeps them thin. It would be hard to eat in there with those walls. 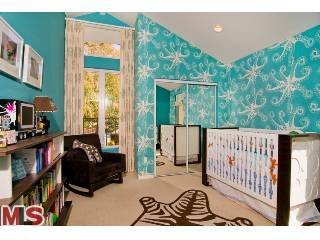 I think the home is gorgeous…with the exception of the kids’ rooms! I like the random colors – such as the sofas and kitchen chairs. And I’m especially lovin that salt water pool!! I LOVE their home. Especially the turquoise sofa in the kitchen. I wish I had one of those in my kitchen. I like their home much more than I thought I would, especially the kitchen. Is it bad that I know the answers to your questions? I love the outdoor spaces and the kitchen. Most of the rooms I like, but couldn’t personally live with those wall paper choices. I like that she goes for it though…well, except for in the bathroom. Very tame in comparison. oh! and Lonnie (sp?) Anderson. Obviously it’s just me since folks here are raving, but between the dining room and the living room, I felt like Dean Martin was going to come out with a martini in his hand and one of the Gold Diggers under his arm. It’s a little to early 70s for me. Also, I worry about Stella and Liam’s retinas. Oh, don’t forget the famous room in “the Manor” talked about on the sitcom that was purely for wrapping gifts!! I am a crazy fan of the show and loved all of the renovating they did to this house, it was just so “cookie-cutter” before they got a hold of it. I can’t believe they are already selling it. Yup she’s moving to a larger place in a really good part of Encino so its okay. and for that there is no cure. I don’t like it. Period. I actually think it looks surprisingly normal. I have to say I really like the outdoor spaces that pool is a WOW !!! I’ll bet her kids aren’t good sleepers, unless they sleep with sunglasses on, YIKES huh ??? ***Is the patient up and about ??? Liz’s comments are cracking me up. I had visions of Liberace at the head of the dining table, myself. 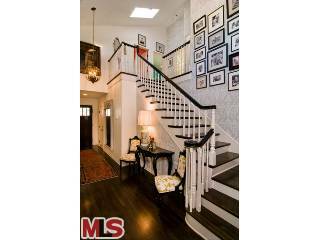 I do like the kitchen/family room and the lovely entry hall with the stairway. Suprisingly demure for where I envisioned a Tori Spelling to live. Well, at least those rooms are. 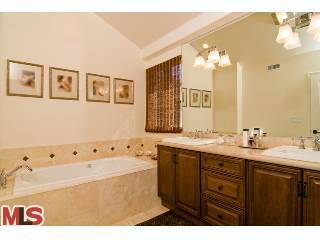 Interesting…….hmmmmmmmm……we thought the master bath would be nicer though!! It’s nice to see something that reflects their personalities instead of “the norm”! Ekk not my style. I’m not a fan of her either really. Aww…that picture makes me sad too. 🙁 Not sure how I feel about this house. On TV it looked OK, but yikes, now I’m not so sure. I love the master bedroom! Banal throughout except for the dining room, which shows cohesion (but looks “Manhattan” to me). The house is okay. My least favorite room is the kitchen as it has so little warmth. I love the OK picture and don’t think that Liam looks ignored or rejected….he looks like he saying “whatcha doin'”? It can be hard to get an 18 month old child to sit still. This is my favorite home EVER. I absolutely adore Hollywood Glamour. Fantastic. I could look at these pictures all day. I’ve actually had them saved on my computer since the episode premiered. Cary’s last blog post..Thank you Nester!!! 3. LONI ANDERSON played her mom. Why are they moving out of this perfect love nest? I like her new house better. But I do love Liam’s nursery – it’s wonderful whimsical! And I love her bright orange couch and the blue one…wonder if they’re bringing them with them to the new house? I’ve never seen any of her shows, but if she’s decorating the new one on her show, I might tune in. Both houses are beautiful. The nurseries are so adorable. I think Tori’s taste is awesome. The house exudes her quirky ecletic tasteful style. It may not be for everyone but that is ok. I do not understand the very negative statements made by some. The comments made about Liam are absurd. The babies are the center of the families lives. If you watch the show, the family seems very grounded even with the cameras rolling. It seems like they are doing a great job. Does anyone now the paint color of the master bedroom – just love it. I love this house! I think Tori and Dean have fabulous style!! Their house has so much personality and it’s design really stands out. So happy to see they aren’t afraid to use color and that its not too “cooki-cutter” 🙂 Love, Love it!! Dean is wayyyy too good to be with tori. He is so supportive and hot. He is genuine and sweet and she is whiny, annoying, and fearful about everything.! All she cares about is planning parties, staying off motorcycles (how unsupportive) , and overcommiting to books while Dean takes care of the beautiful children. Make a new airsickness bag Dean! You deserve way more!!! !